Those of us who study a particular topic or era, as I do, come to identify certain individuals as role models. 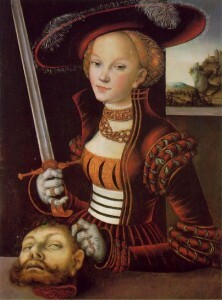 Amie Sparrow is one of my role models in 16th century German costuming. Several years ago I found Amie online through her blog, where she posts dress diaries, research notes, and period images that inspire her. I find her information valuable and have tried to follow her example through my own blogs. And I believe I have shown considerable restraint in waiting until my seventh article in this series to focus on her and her wonderful adventures in 16th century Germany. But I digress … let me tell you about Amie! Many of Amie’s images do indeed look like she’s walked out of painting. So it should come as no surprise that the Smithsonian Museum of Natural History itself asked Amie to create two early 17th century blackwork coifs for an archaeological exhibit. Now that is an arts and sciences project! Amie’s coifs were fully documented and the exhibit opened in May 2013. As far as I am concerned, being asked by a museum to reproduce an artifact is a penultimate achievement for a costumer! Amie tells me making these coifs was the most fun she’s had working on a project to date, and she notes that the Smithsonian found her because she posted a photo of one of her embroidered coifs online (if this isn’t a good reason for everyone to share their projects online, I don’t know what is). Amie has made a lot more than coifs, though. Her favorite projects to date have been her German leather and velvet purses, a 1527 Gotha peasant dress, and her first sweet bag. My personal favorites are her 1577 Nuerenberg Gown and her array of German Woman’s Gollers, which you can learn to make yourself in the goller tutorial (see below). Amie teaches often. Of late, she’s been teaching German Peasant Garb classes, which is a topic in sore need of attention! She says, “I was asked to teach that topic a couple of months ago for The Shire of Isenfir so they could learn about German peasant clothing for their Gemütlichplatz event. 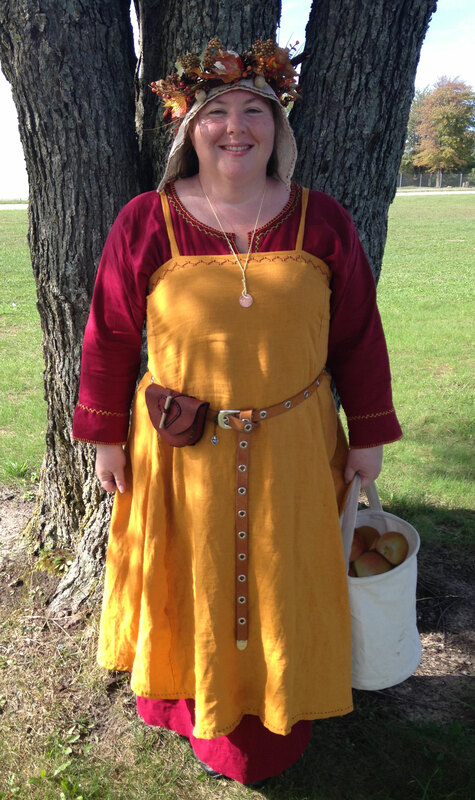 I found that I could talk for two hours without a break on German peasant clothing.” For Pennsic next year, she’d like to teach a make-and-take class on German purses. Amie’s next project will be to make a new dress based on artwork by Freydal for Crown Tournament. And as the former Mistress of St. Anne’s Guild of Clothiers, she is running a Garb Triathlon at Atlantian Crown Tournament in November. Other items in the works are a research paper on German clothing, a woodcut with accompanying documentation, and possibly a pair of leather shoes. Sounds deliciously ambitious! So what inspires Amie? She has many friends in the SCA who inspire her with their quest for knowledge and authenticity. When pressed for names, Amie says, “Chiefest among the German researchers/costumers are Mistress Sophia Kress, Mistress Katrine De Saint Brieuc, Baroness Emma West, Herrin Genefe Wolflien and you. Truly, I get inspired by a lot of people. If someone is making cool stuff, I want to know that person.” It will come as to surprise, Dear Reader, that Amie inspires me. I asked her for her words of wisdom, so I could pass them on, and this is what she told me, “Have No Fear! To paraphrase Frank Herbert: Fear is the A&S killer. Many people psych themselves out of participation because they think that their work is not good enough. Well, I’m here to tell you, there’s always somebody who is going to be better than you, so don’t worry about how good you are. It’s a waste of time. Enjoy what you do. Base your A&S in some kind of research and show off your efforts. If you don’t try, you don’t learn. Want to know what I do with my A&S failures? I keep them. I wear them. I use them as examples in classes.” Well said, Amie! Her favorite quote about artists is attributed to both Ray Bradbury and Kurt Vonnegut. “We have to continually be jumping off cliffs and developing our wings on the way down.” If you see something you want to make, then make it. You will succeed. All you have to do is try. 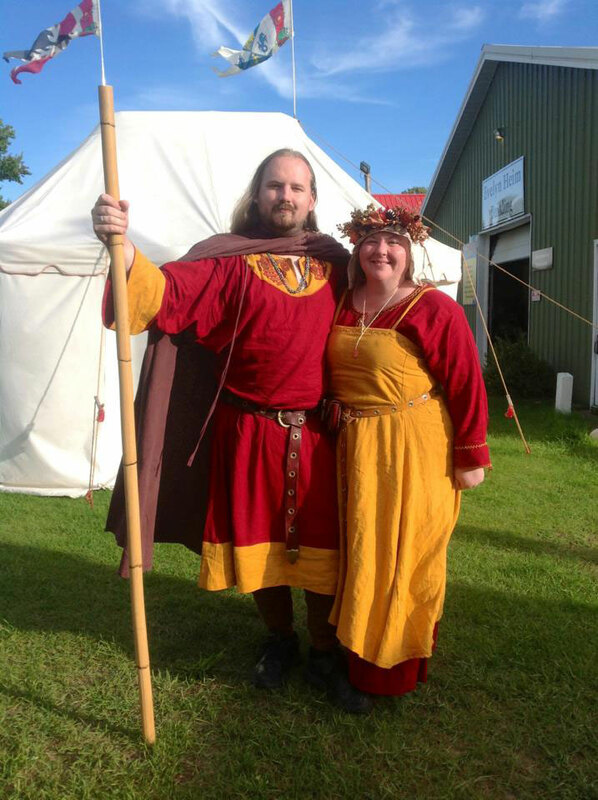 Amie lives far away from me within the Barony of Stierbach in the Kingdom of Atlantia, though I had the good fortune to meet her in person at Pennsic 42. She is apprenticed to Master Tristan Alexander and a protege of Mesterinde Karen Larsdatter. She is the recipient of many awards, including the Atlantian Order of the Pearl which honors and recognizes those subjects who have distinguished themselves by their efforts and their excellence in the arts and sciences of the period and/or their willingness to teach those same arts and sciences (this is a grant-level award, roughly equivalent to the Midrealm Order of the Evergreen). I’ve always been surprised that Amie is not a member of the Order of the Laurel yet, and I hope to see her so honored in the near future. Amie has a high standard of excellence and she frequently applies her knowledge for the instruction of the Society at large through her classes, guild, and writings. As I mentioned, Amie’s gollers are one of my favorite things she’s made. A goller is the German word for “yoke,” and as a clothing element it refers to a variety of styles, such as very short capes worn on top of clothing, vests worn both in and out of the clothing (i.e. partlets). For this tutorial, we’re using goller to mean a short cape worn by women in 16th c. German images. If you’d like to learn more about gollers, please read my more in-depth article on German Gollers at GermanRenaissance.net which I’ll be posting in a few days (along with a cross-post of this tutorial). 1. (Optional) Using the pattern, cut out two fronts and one back from your muslin. Stitch together along the indicated areas on the pattern and try it on. Adjust as necessary. Also pay attention to the line of the shoulder, as you may need to adjust the curve there so that your shoulders fit inside. Modify your pattern as necessary. 2. Using your customized pattern, cut out two fronts and one back from both your outer fabric and your lining. I used a rose damask for my outer fabric, and thus needed extra fabric to match the patterns nicely. My inside fabric is a slightly fulled dark red wool. My outer and inner fabrics, pinned and ready for sewing. 3. Sew your outer fabric pieces together along the orange dotted lines on the pattern. 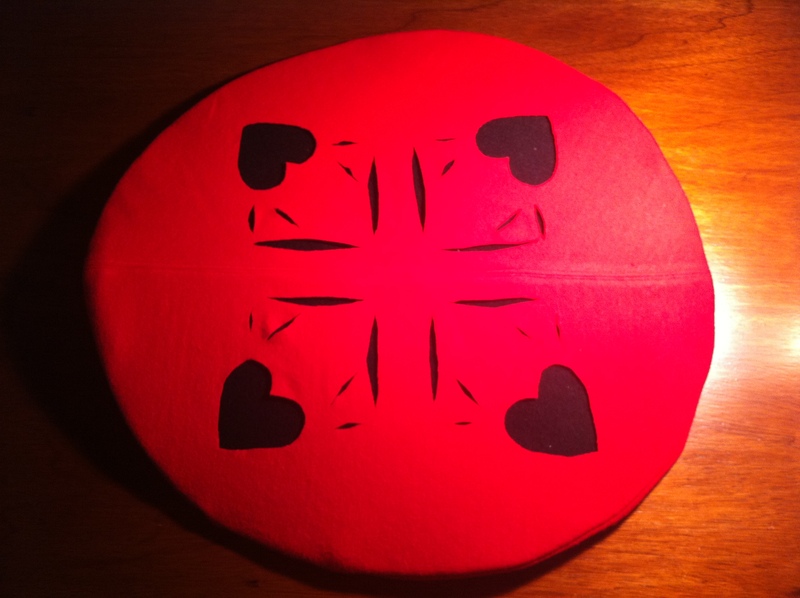 You could do a simple seam and press open, or a flat-felled seam (which is likely to be more period). I would avoid a French seam, however, as I think it would produce too much bulk at the shoulder. Repeat with the lining fabric. Do not yet sew the outer fabric to the lining. 4. (Optional) If your outer fabric will have any guards (trim), now is the time to add it. Don’t try to attach a straight line of fabric and curve it — rather, lay the sewn outer fabric on top of your trim fabric, smoothing it flat as much as possible, outline it with calk on your trim fabric and cut out the same basic shape from the trim fabric. Now cut the guards from the shaped trim fabric in even strips—I cut 3.5 inches from the bottom guard followed by 2.5 inches for the narrower guard. I used the remaining fabric to cut 3.5″ x 11″ strips for the two side guards. 5. (Optional) If you cut guards in the previous step, sew them on now. To do this, I first pinned the narrow guard into place using a ruler to make sure I was at a consistent distance from the bottom, then I sewed the top edge down, folded it over, pinned it, and sewed it down by hand in small, neat backstitches. 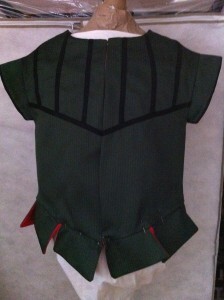 The bottom guard’s top edge was sewn down, flipped over, and pinned (but not yet sewn). I did the same thing for the two side guards — sew, flip over, pin, but not sew. 6. (Optional) If you are using ties rather than cloak clasps, you’ll want to pin them in place now so that they are sewn in when you do the next step. 7. Now you attach the outer fabric to the lining, right sides together, along the blue dotted line on the pattern. I start sewing at the bottom of one side, sew up to the collar, sew around the collar, go down the other side, and sew roughly 1/3 of the way around the bottom curve. Then I went back to the other side and sewed another 1/3 around the bottom curve from the other direction, leaving 1/3 in the center back bottom unsewn (the red dotted line on the pattern). I then clipped the corners (to avoid bulk at them), turned the goller right side out, smoothed all my corners and edges, and ironed it flat. 8. To finish sewing the outer fabric to the lining at that open edge in the back, fold each raw fabric edge along the red dotted line inside to create a nice seam, pin, and sew together using a blind stitch. When you’re done, remove the pins and iron to make sure it’s all nice and flat. 9. If you’re using cloak clasps, sew them on securely now with doubled or extra strong thread. Be sure to sew through all layers of fabric for a better drape and fit. Time Spent: If you make a goller without guards, you can make this in under an hour. The guards add another hour or two, depending on how fancy you get with them. Here’s me in my new goller at Red Dragon — it was 45°F and the wool goller kept me feeling quite comfortable! Many thanks to Amie for the wonderful pattern! When I was new to the SCA, the sitting queen of the Middle Kingdom was the lovely and wise Runa. Today she is a Duchess, but she will always be my first Queen. She is kind, very talented with the needle, and quintessentially Norse. When I think of Norse and Viking, I think of Runa. She has the most beautiful Norse apron dresses. 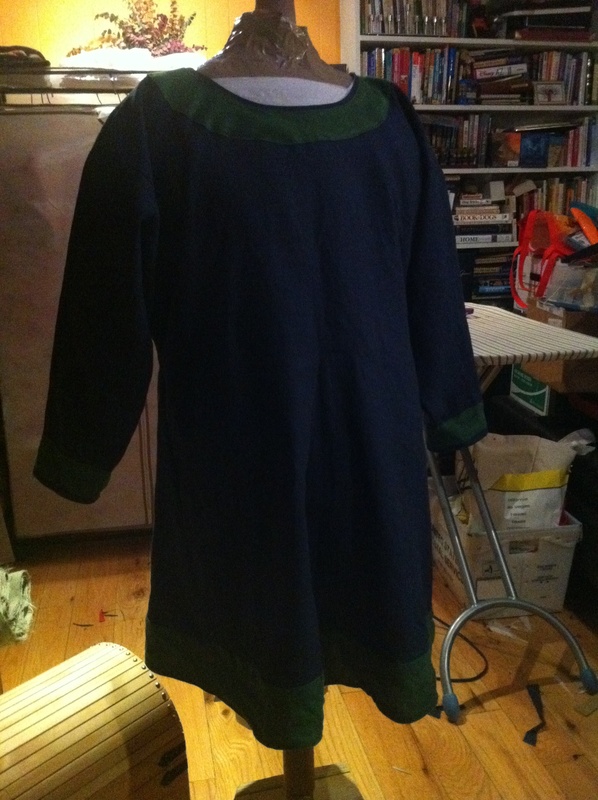 So when I embarked on my Artisan Quest, I decided to make a version of Duchess Runa’s Apron Dress for myself! She graciously consented to share her pattern, and gave me permission to share it with you here. 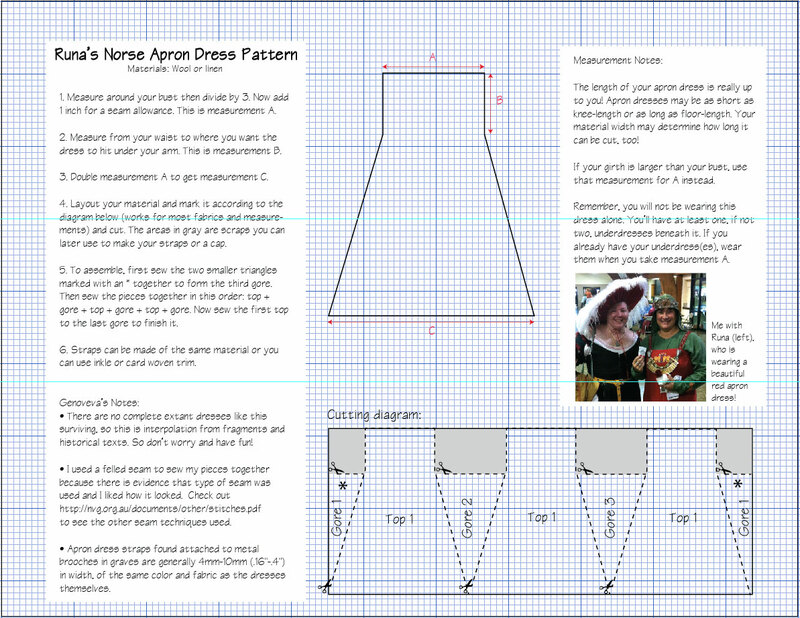 I’ve put Runa’s pattern into a handy PDF file, along with some of my notes. You can either download the full PDF, or simply click the image below for a closer view. 1. Measure around your bust then divide by 3. Now add 1 inch for a seam allowance. This is measurement A. 2. Measure from your waist to where you want the dress to hit under your arm. This is measurement B. 3. Double measurement A to get measurement C.
4. Layout your material and mark it according to the diagram below (works for most fabrics and measurements) and cut. The areas in gray are scraps you can later use to make your straps or a cap. 5. To assemble, first sew the two smaller triangles marked with an * together to form the third gore. Then sew the pieces together in this order: top + gore + top + gore + top + gore. Now sew the first top to the last gore to finish it. 6. Straps can be made of the same material or you can use inkle or card woven trim. The length of your apron dress is really up to you! Apron dresses may be as short as knee-length or as long as floor-length. Your material width may determine how long it can be cut, too! If your girth is larger than your bust, use that measurement for A instead. Remember, you will not be wearing this dress alone. You’ll have at least one, if not two, underdresses beneath it. If you already have your underdress(es), wear them when you take measurement A. Me with Runa, who is wearing a beautiful red apron dress! There are no complete extant dresses like this surviving, so this is interpolation from fragments and historical texts. So don’t worry and have fun! I used a felled seam to sew my pieces together because there is evidence that type of seam was used and I liked how it looked. Check out http://nvg.org.au/documents/other/stitches.pdf to see the other seam techniques used. Apron dress straps found attached to metal brooches in graves are generally 4mm-10mm (.16″-.4″) in width, of the same color and fabric as the dresses themselves. The apron dress only took one day to cut and sew (and not even a full day at that)! It was easy and very comfortable to wear. Once your apron dress is complete, you can embellish it with seam treatments, appliques, and/or jewelry. Those are topics for another blog post, though! Many, many thanks to Duchess Runa for being such a wonderful inspiration! The Landsknecht were famed German mercenaries from the late 15th century to the middle of the 16th century. The daring soldiers were well compensated for their dangerous work, and when you combine that with the fact that they were exempt from most sumptuary laws, you get a group of people who enjoyed dressing flamboyantly. Their clothing tended to be bright (dye was pricey) and slashed (showy and hid tears and rips). Feathers were common because the merchants who followed the train sold them, and it was easy to buy one and just “stick a feather in your hat.” To learn more about the history of the Landsknecht, I highly recommend the 2002 book, Landsknecht Soldier by John Richards — it is well researched and illustrated. 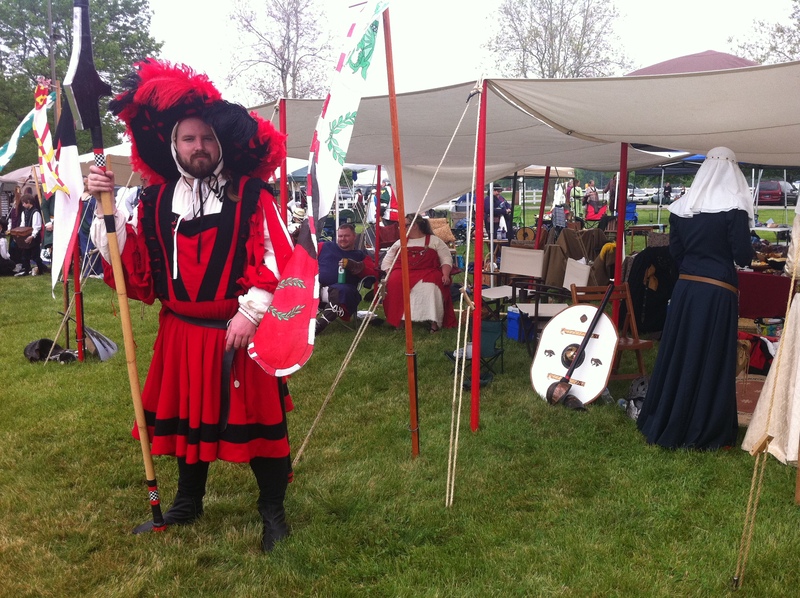 Renaissance Costuming FAQ – Scroll down to the section on Landsknecht about midway down for a good overview of what men and women wore. 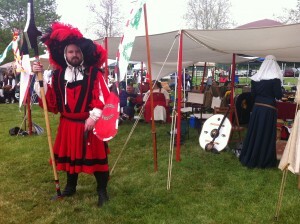 St. Maximilian – The web site of a company of the St. Maximilian Landsknecht Re-enactment Guild (check out the Costuming Guidelines). 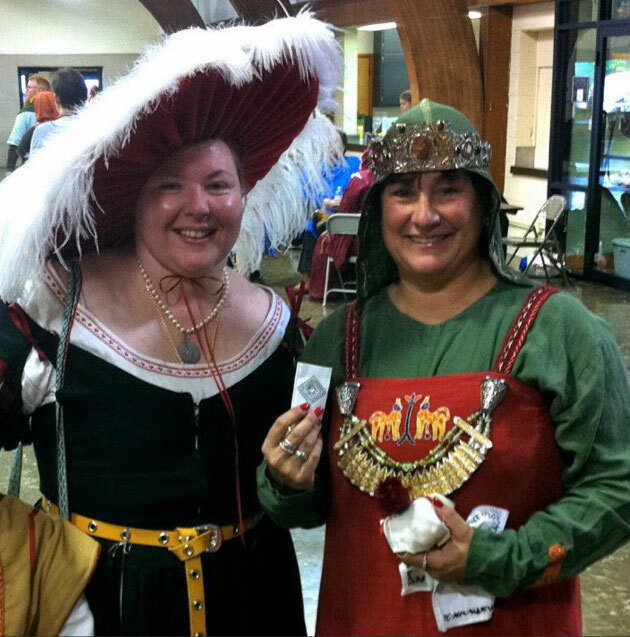 Landsknecht Guild of St. Maurice – Check out their Resources page! Landsknect Dress Diary – Good detail! SCA German Renaissance Garb – Excellent resource with lots of images, research, and projects! Woffenrock Dress Diary – Not entirely period, but interesting — and contains a number of links to source images which are helpful. 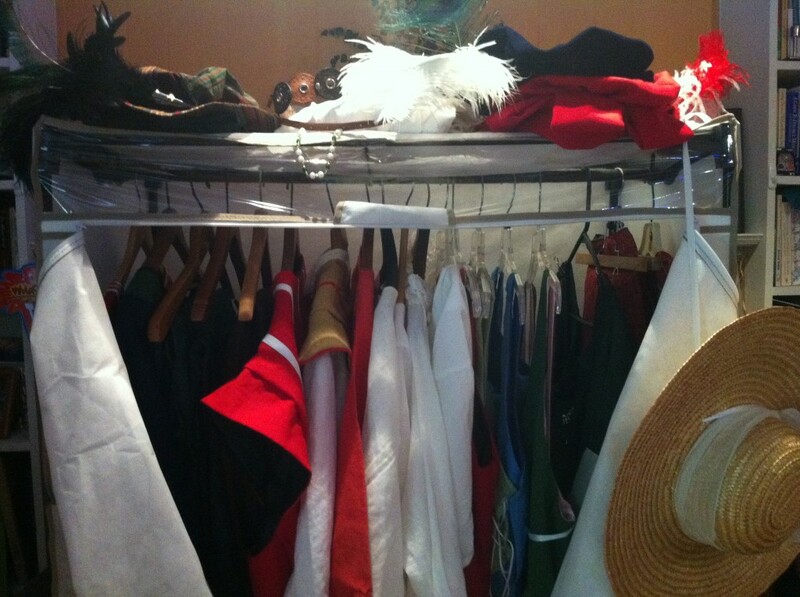 Hats and Underwear of the German/Swiss Woman from the 15th century – Not in English, but full of great information. Landsknecht Woodcut Gallery – 24 images! Woffenrock by Reconstructing History – I used this to make Gregor’s Woffenrock and I think it turned out well. Last May I was given a bit of beeswax as a prize. I thought at first it was a candle, not knowing what beeswax could be used for other than a candle. But I looked it up and discovered it was useful in sewing — you use it to strengthen your thread and keep it from knotting. I tried it and it was AMAZING. I’ve been using it ever since, and really see the benefits of it. I then bought some beeswax, melted it, and created my own little bits of beeswax. 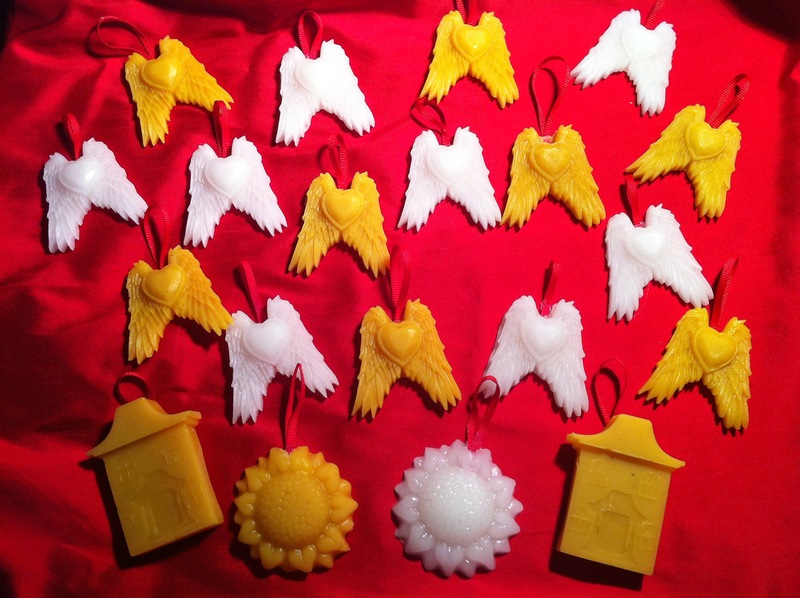 Some of these will be gifts at Cynnabar’s Grand Tourney, and the rest I’m keeping to just give out to people I meet — I want everyone to know the wonders of beeswax. Sewing – run your thread through the beeswax several times to strengthen it and minimize knotting. That’s not all — you can also use it to make candles, ornaments, soap, crayons, wood filler, jar seals, lip balm, etc. etc. It even has medicinal uses — beeswax is used for lowering cholesterol and for relieving pain. It is also used for swelling, ulcers, and hiccups. Beeswax has a high melting point of 144 to 147°F, so you can keep it with you without fear of it melting. Oh, and it smells divine. Everyone should have some beeswax! 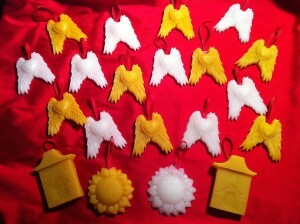 Come see me at Cynnabar’s Grand Tourney on December 3 and I’ll give you some 100% beeswax. 16th century Germans wore many hats, one of which we call a Tellerbarett (platter hat). 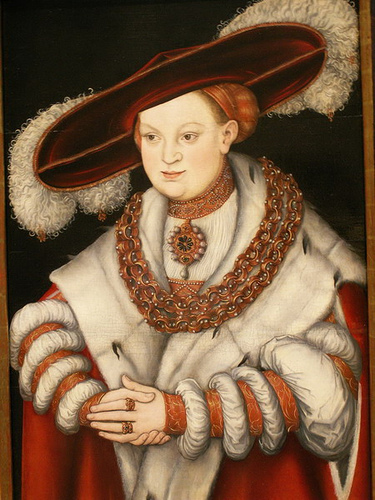 You can see versions of this large, round, flat hat in many paintings and woodcuts of the era. I could find no reference to surviving hats from this era, so I have only images to go by. It seems clear to me that the hats were constructed in different ways — each of the three images below shows a slightly different construction — but they all share the large, round shape and feathers are common. This is a big hat, and I may need a shot of courage to wear it, but I really like it. The feathers are wispy and fun. And I like the pattern I slashed into the top (they are winged hearts) — it’s not traditional, sure, but it makes it unique and personal. Cut out two pieces of wool (one in main color, one in constrasting color) in 20 inch diameters. (Optional) “Slash” (cut with good, sharp fabric shears) a pattern in the circle of your main color wool. If your wool is likely to fray, either hem the edges of the slashings or use something like FrayBlock on the edges. Baste the two circles together along the edge. Cut out a strip of wool in your main color 8″ wide by 63″ long (63″ is the circumference of the 22 in-circle you cut in step 1). Sew a casing with a narrow ribbon along one edge of your wool strip. You will later use this ribbon to pull in the strip to the circumference of your head in step 8. Sew the raw edge of the wool strip to the edge of the wool circle, right sides together. Sew the narrow ends of the wool strip where they meet. Take two wire clothes hangers, cut each to form a long wire, secure the ends of the two wires together (I used duct tape because it was handy), and bend the now one long wire into a circle. 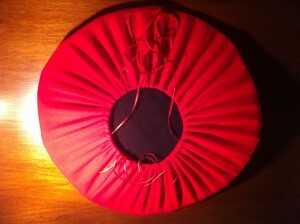 Sew this circle to seam edge of your wool circle, trying to stay as close to the seam you created in step 5. 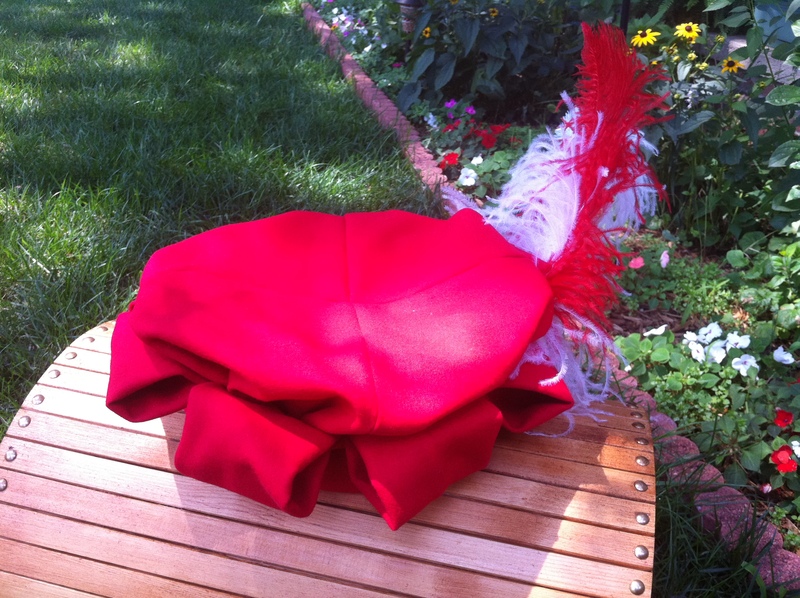 Turn your hat right side out, pull your ribbon in the casing tight until it fits your head, and try it on. 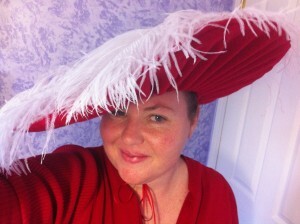 If you need help keeping the hat on, as I do, you can sew ribbons to either side of the casing to tie under your chin. This project took me about 4 hours. I’m so happy … today Gregor departs on his long journey from the far reaches of Artemisia, arriving here in the Middle Kingdom tomorrow. Then begins a long weekend of more Pennsic preparation — shield bending, weapon taping, shade fly assembly, bed shopping, packing, etc. etc. So much to do, so little time … but what fun! My Garb-A-Day project has been coming along well. I’ve been able to stick to stitching nearly every day — I took a two-day break last weekend to work on benches, but otherwise it’s been at least something new everyday for nearly three weeks now! My sewing skills have improved, too! I have modified my original plans as I went along — I decided not to make three Flemish overdresses because five layers of linen is really just too much for summer, I think. But I made all the kirtles and smocks. I’m working on tie-on arms today for two of my kirtles, plus a partlet. And that’s not even everything — some items aren’t in there because they are in my “to finish” pile (Gregor’s Elizabethan shirt, my tie-on arms, partlet) and one of Gregor’s tunics is coming back with him. I am pleased! 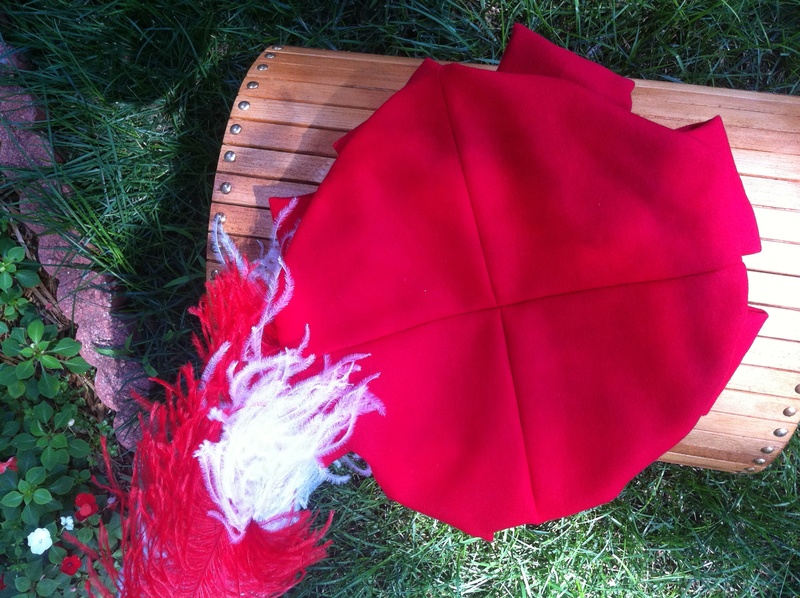 Gregor’s Red Wool Schlappe “Starfish” Hat — With Feathers Like the Landsknecht! 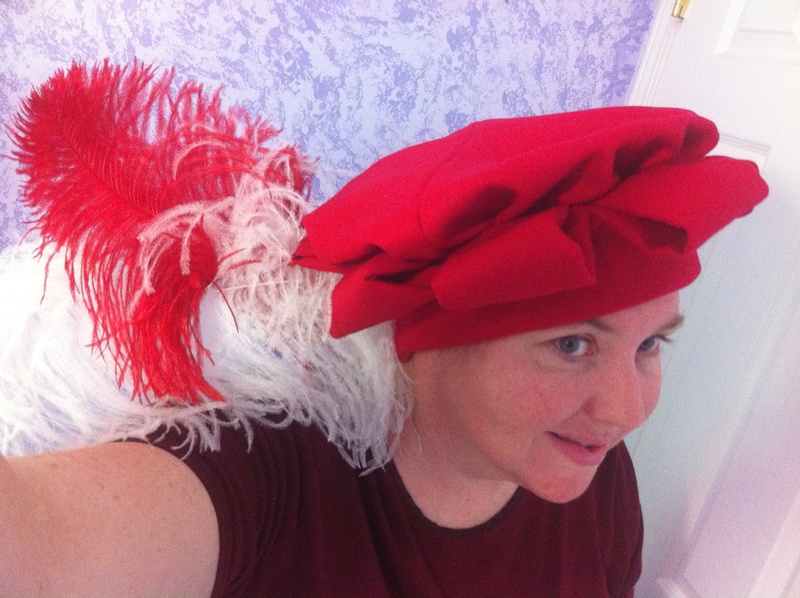 Since last night’s experiments making a Landsknecht hat went went, I started working on it again as soon as I got up! 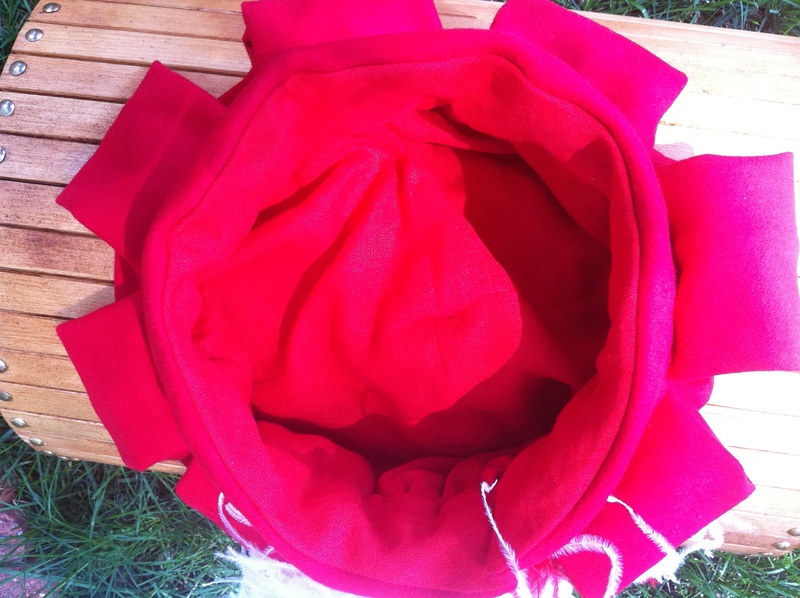 I used some lightweight red wool, with red linen for the lining. 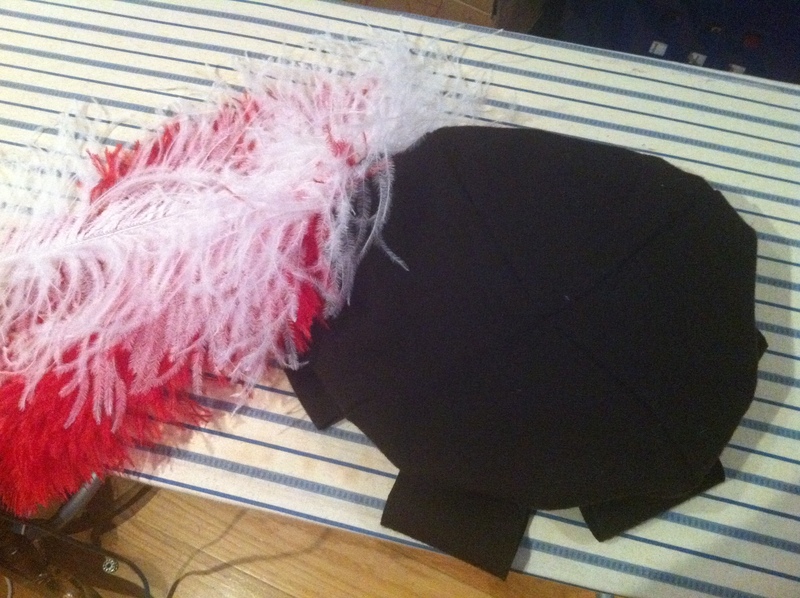 I made the hat bigger in all ways — bigger brim, bigger slashings (the loops that stick out, bigger cap on top. I thought last night’s seem a bit too modest for a Landsknecht. I machine stitched the loops to the brim, then handstitched everything else. It didn’t take too long, especially once I finally tried using the beeswax I’d received in “AnneMarie’s Favor” Award from Duchess AnneMarie’s Half Century Holiday — what a difference the beeswax made in avoiding snags and tangles in my thread! 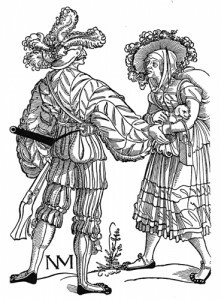 Landsknecht were German mercenaries in the 15th and 16th centuries, with a reputation for being very good fighters. 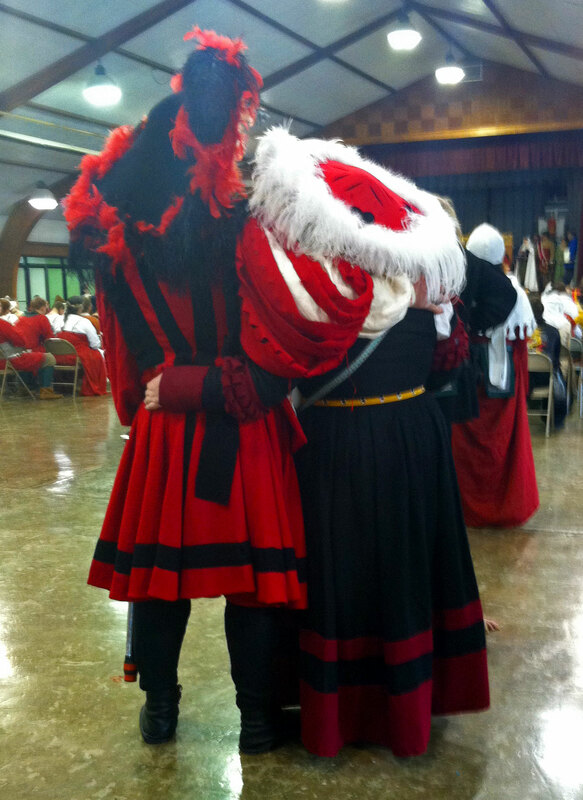 Gregor has a particular interest in them, and one day would like to don the entire garb of a Landsknecht! 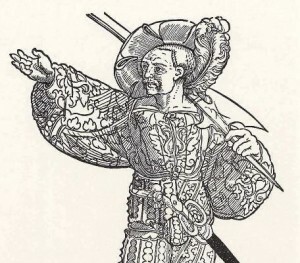 To the right you can see an illustration of a Landsknecht with a similar hat — this illustration is a woodcut by Erhard Schön (1491-1542) from Nuremberg, Germany. I am very pleased with the results! I cannot wait to see it on Gregor — and he arrives from the faraway lands of Draca Mor in just three days! I can’t wait to see him. If anyone is interested in how I made this hat, leave me a message here. I’d put the pattern up now, but I need to get back to sewing … Pennsic is so close and I have so much to do! Just know that you will probably need to wait until after Pennsic for a detailed response. 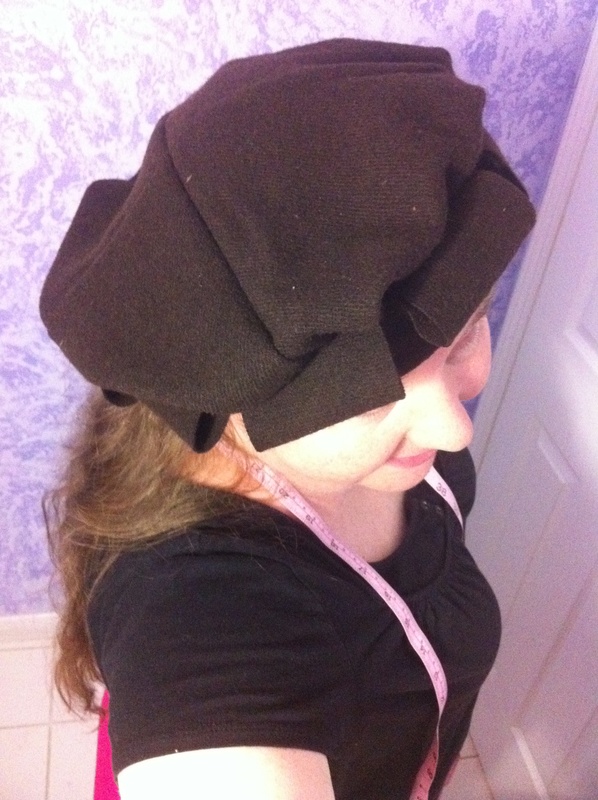 Back to sewing… so much to do before Pennsic! Today’s Garb-a-Day project was a simple blue tunic. I had just two yards of linen to use, but Gregor’s tunics really required more like 2 1/4 yards (to get his desired length of 41″). So I just added a band of green linen to the hem to make it longer, then added the same green as trim around the wrists and neck. 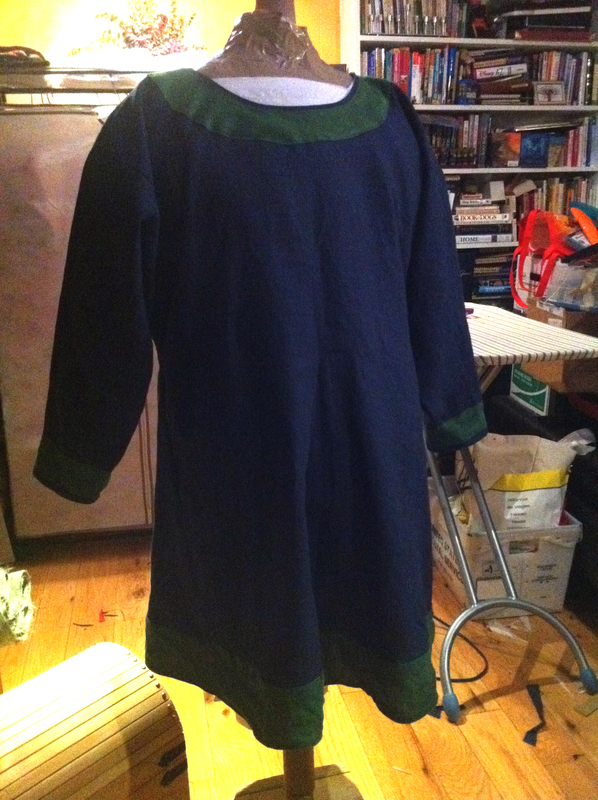 I cut the green linen for the neckline on the bias, so it would be a bit more flexible. That works, I think! 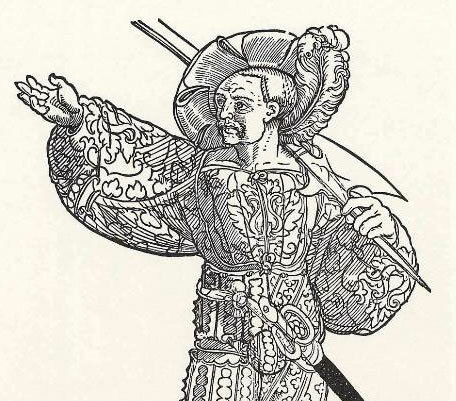 The tunic design I use is based on an extent garment from the Bochsten Bog, and as such, it uses several gores (triangular pieces of fabric that made the tunic flare out a bit at the bottom). When gores are placed on a seam line, they are simple. But when you have to actually cut the fabric and insert the gore, as you do with this tunic, it gets much tricker! The first time I did gores, I had no idea how to sew them. This explained the basics, and it worked … but I noticed a slight pucker in the fabric at the top of the gore when I stitched the gore with my sewing machine. The pucker appeared on the next tunic as well, and at that point it bothered me enough to do more research. After reading a great deal about how to make perfect gores, I decided to try hand-sewing just the gore point, then machine sewing the long seams. It worked! This tunic now has perfectly-pointed, pucker-free gores — hooray! 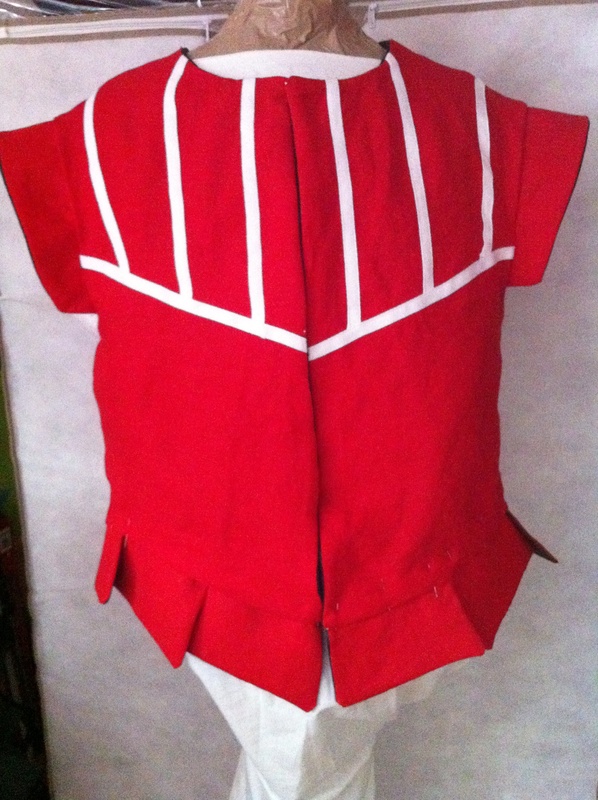 After a busy couple of days filled with “real life” activities, I’ve finally managed to (mostly) complete the reversible doublet (or jerkin, as it has no arms right now) for Gregor. Again, I used the same Simplicity 4059 pattern as I did for my son’s doublet and I’m very pleased at how it turned out. It’s not yet complete — I need to add the trim around the peplum, slip-stitch the red linen bottom down, and hand-sew the eyelets. As that is all handwork, I’m saving it for the late evenings when I’m just hanging out with Gregor or playing D&D. The red you can see on the edges of the peplum on the green side should get mostly covered by the black trim.